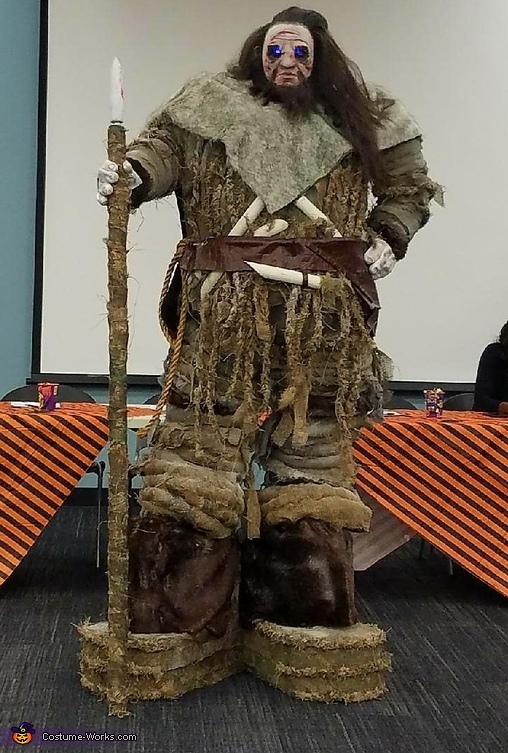 My hubby is wearing a homemade wun wun costume. Being a huge GoT fan this character really resonated with my husband. It took me approximately two weeks to complete and about $350. I started out by determining how tall I wanted him to be, I settled on 8 feet tall. That meant I had to make a stable walking platform. Next was building a body suit out of pipe insulatio, different color burlap, faux fur and pleather. I then added detail touches such as paint color and blood on the mask to make the character more realistic and spray paint to make burlap appear dirty. The final and one of the coolest touch were the blue leds used for the eyes. As you can see the results were pretty good in my opinion and people really were amazed with his costume. I'm so proud of this work I just want to continue to share with others.